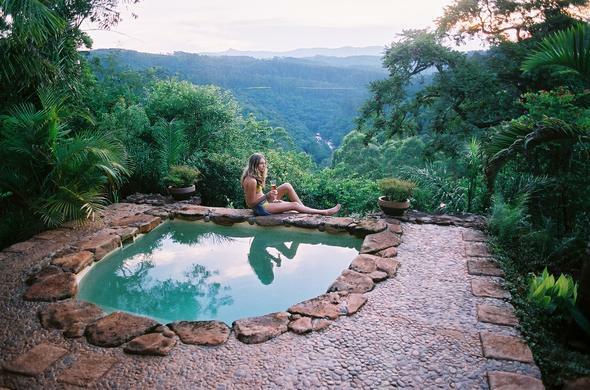 Experience the beauty of Africa in unashamedly romantic surroundings at Timamoon Lodge near Sabie in Mpumalanga. Gaylyn and Maurice Hammond have created a magical world bringing together their experiences in Morocco, the Sahara, Zanzibar and Malawi under one roof. Individual thatched lodges are luxuriously appointed with mosquito net draped four poster beds, each with a private pool and views of the Sabie River bordering the retreat. A team of renowned chefs whip up exotic, flavoursome meals that can be enjoyed at the candlelit restaurant at the small pond that overlooks he tropical garden. End off a spectacular dinner at the cigar lounge that comes with its own magical ambience. Timamoon is a 30 minute drive to the Kruger National Park and is situated in a Malaria free area. It is also close to the breathtaking Blyde River Canyon. Activities that can be enjoyed while staying at Timamoon includes river rafting, bird watching, abseiling, quad bike trails and horse riding. Alternatively, you can enjoy a yoga session the the tranquil environment.